Happy hour! 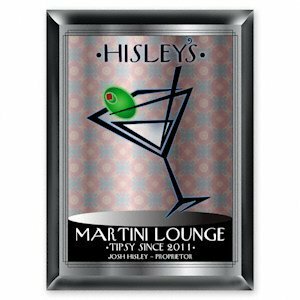 The subtle, colorful background with a black frame and a graphic green olive on this sign make it reminiscent of a swanky New York martini lounge. Add some class to your lounge as you let guests know that you are open for business. Consider giving this trendy, customized sign as a very personal housewarming gift to friends and family members who might enjoy a martini.